The New-And-Improved-For-2009 Diva Dutch operates like a regular schoolyard game of jump rope/fashion show/hip hop freestyle/dozens. Duration: This game is fast-moving and will allow for people to jump in for quick bursts of play..
30 Days of Diva Dutch is a series of site specific performance art pieces called Diva Dutch, in which local black women, from varying parts of the African Diaspora, dress up as divas and acquire exaggeratedly long braids in styles created by local black hair braiders. 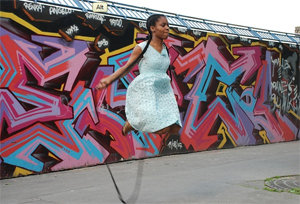 Viewers are then invited to physically engage with bodies of two particular black woman by jumping rope in their braids. "I kick a A' for arrow, a 'B' for Bodacious, a 'C' for [jumper makes a coughing sound] cuz my style's so contagious,..."
In order to win, a jumper must jump/rhyme the entire alphabet from A-Z. In order to win, a jumper must jump/rhyme the entire alphabet from A-Z. Each player gets 2-3 turns depending on the length of the line. S/he may pickup at the letter of the alphabet where s/he left off on his/her last turn. If s/he is not able to complete the alphabet in 2-3 turns, s/he must head to the back of the line and start over from "A" on her/his next jump. Aisha Cousins is a Brooklyn based artist. Her current project, Diva Dutch, is a series of site specific, participatory public performances. Diva Dutch is part of a larger series entitled Artifacts from Soulville, which centers around the rituals and artifacts of an imaginary black enclave, Soulville. The series draws upon Cousins� experience as a tour guide for the South Street Seaport Museum, during which time she developed object based learning curricula utilizing artifacts from New York City�s early Dutch settlers. Through the exploration of objects and rituals from the imaginary Soulville, Cousins engages viewers in examining various aspects of the psycho-social-cultural fabric that connects contemporary black Americans.